As of May 29th, I am now a member of the Third Order of Penance of St. Dominic, which is better known, as a 3rd Order Dominican. The Order to which I am now a postulant is affiliated with the Dominican Friars of Steffeshausen, a newer community of traditional Dominicans. As a Traditional Third Order Dominican, I will be following the Rule that was in place as of 1923, the last Rule for Dominican tertiaries before the Second Vatican Council. 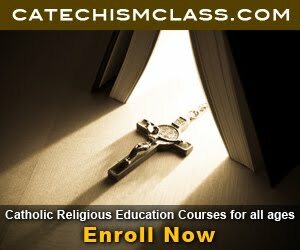 I will begin my studying with the text of Fr. Joret entitled "Our Dominican Life." 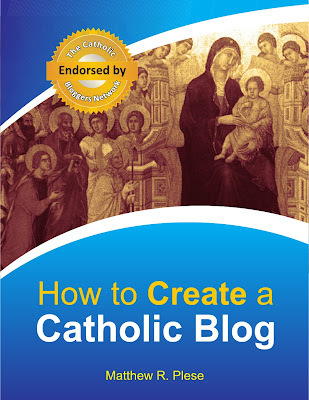 In order to spread the spirit of the Order, I have a copy of this book in PDF and I'd be happy to send it out via email to all who are interested. Just email me to request it. I am far from perfect and pray that this Rule help me in my quest for spiritual perfection. Please pray for me to grow in grace and seek the salvation of souls. St. Dominic, pray for me! Blessed be the Holy Trinity and undivided Unity. We will give glory to Him, because He has shown mercy to us. Ps. 8:2. O Lord, our Lord, how glorious is Your name over all the earth! V. Glory be . . . 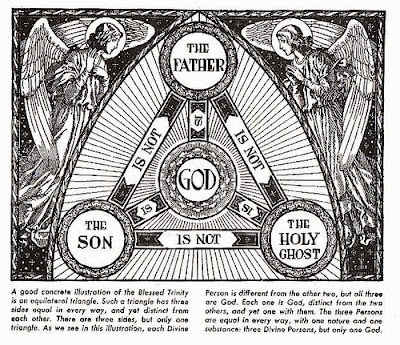 COLLECT - TRINITY SUNDAY - Almighty and ever-living God, to You we owe the grace of our true faith, which enables us to acknowledge the glory of the eternal Trinity and to adore the blessed Unity through the power of Your majesty. Grant that by holding fast to that faith we may always be guarded against all afflictions. Through our Lord . . .
Commemoration of the FIRST SUNDAY AFTER PENTECOST - O God, the strength of all who place their trust in You, graciously hear our prayers. Because of our weak human nature, we can do nothing without You. Help us by Your grace that we may fulfill Your commands and please You in will and action. Through our Lord . . . Blessed are You, O Lord, who behold the depths and are enthroned upon the Cherubim. 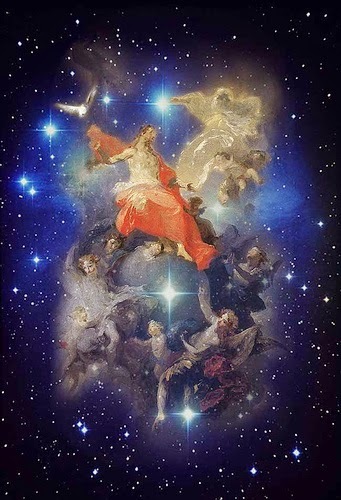 V. Blessed are You, O Lord, in the firmament of heaven, and worthy of praise forever. Alleluia, alleluia! V. Dan. 3:52 Blessed are You, O Lord the God of our fathers, and worthy of praise forever. Alleluia! At that time, Jesus coming, spoke to them, saying: "All power is given to me in heaven and in earth. Going therefore, teach ye all nations: baptizing them in the name of the Father and of the Son and of the Holy Ghost. Teaching them to observe all things whatsoever I have commanded you. And behold I am with you all days, even to the consummation of the world." Blessed be God the Father, and the only-begotten Son of God, and the Holy Spirit, because He has shown mercy to us. SECRET Bless this Sacrificial Offering as we call upon Your holy name, O Lord our God, and through it let us too become an eternal offering to You. Through our Lord . . .
SECRET - Commemoration of the FIRST SUNDAY AFTER PENTECOST Graciously accept the offerings we dedicate to You, O Lord, and let them win for us Your unending assistance. Through our Lord . 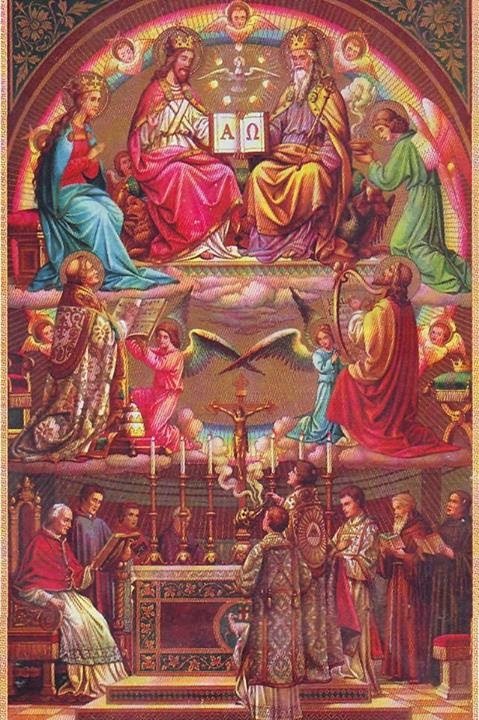 . .
We bless the God of heaven, and we will praise him before all men, because He has shown mercy to us..
POST COMMUNION - O Lord, our God, let us be made strong in body and soul by the reception of this Sacrament and by acknowledging the Holy, Eternal Trinity and its undivided Unity. Through our Lord . . .
We have received Your exceedingly great Gifts in all their fullness, O Lord. Grant that we may use these graces for our salvation and never cease to sing Your praises. Through our Lord . . .
O Lord Jesus Christ, Lover and Saviour of souls, Who didst choose to die for all men and whose Sacred Heart yearns that no soul may perish, but that all may come to the knowledge of Thy truth, grant, I beseech Thee, the salvation of all mankind. Have pity on all Catholics, that they may be true to Thy Faith, steadfast in its practice, faithful to their duties, holy in their lives and happy in their deaths. Have mercy on all those disinherited children of God who find themselves in the Christian denominations which are separated from Thy One True Church. Grant them the light to see and the strength to embrace the fullness of Thy truth. 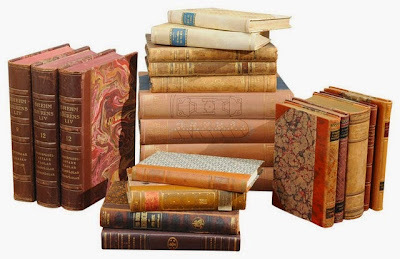 Encourage them to read and study, and help me to find the means of giving to many of them good Catholic books and of bringing them to instructions. Have mercy, O my God, on the great sad multitude of our fellow countrymen, who wander like lost sheep, far from true Christian teaching. Multiply the number of Thy priests, stir up the zeal of Thy laity, so that all Thy wandering children may be brought to the knowledge and the love of Thy full truth. Amen. O Lord, have mercy also on the pagan nations of the world, the sad thousands of millions who walk in the darkness of the shadow of the valley of death. Have pity on abandoned sinners, on the malicious, on outcasts, on the fallen and on the depraved. Have mercy on the dying and especially on those who have none to pray for them. With all the fervor of Thy Sacred Heart, my Jesus, pray and beseech Thy Heavenly Father for the conversion of all sinners, and for the perseverance in Thy grace of all the just. Amen. O most merciful Jesus, Shepherd of souls, behold the great multitude of the heathen, redeemed and purchased by Thy Sacred Blood and Thy horrible agony, still wandering far off from Thy holy Fold and ignorant of the very existence of their Redeemer. O Jesus, the abundant treasure of Thy Blood has purchased a million times over those souls so dear to Thy Sacred Heart. Stir up in all Thy faithful a burning zeal for missionary endeavor, a great generosity toward missionary works, and an immense desire to convert the whole world and bring all men to the knowledge of Thy truth. Amen. 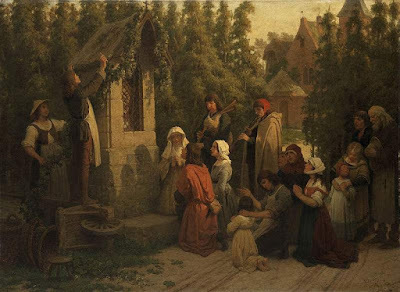 During the Octave of Pentecost, the Church traditionally celebrates the Summer Ember Days. Today is Ember Wednesday. This Friday and Saturday will also be Ember Days. As per the traditional discipline of the Church, Ember Days are days of Fast and Partial Abstinence. (Friday of course being a day of complete abstinence). If you wish to read more about the Ember Days, please see my post from last year. CORDAID, which stands for "Catholic Organization for Relief and Development Aid," is a co-founder and current affiliate of Caritas Internationalis, the Vatican-run umbrella organization that oversees Catholic charity, aid, and development organizations (like Catholic Relief Services) all over the world. Caritas constitutes part of the governing body for the international Marxist organization known as the World Social Forum, which is avidly pro-abortion and pro-homosexual. CORDAID is the local Caritas affiliate for the Netherlands. 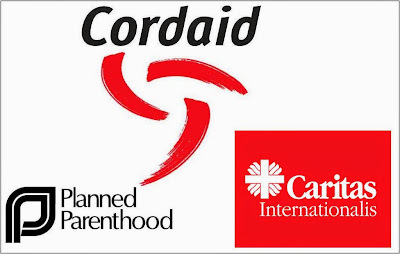 CORDAID promotes abortion, funds Planned Parenthood and Marie Stopes International, and dispenses contraception of every kind, including abortifacient contraception. CORDAID goes out of its way to make condoms and contraception readily available to the youth at little or no cost. 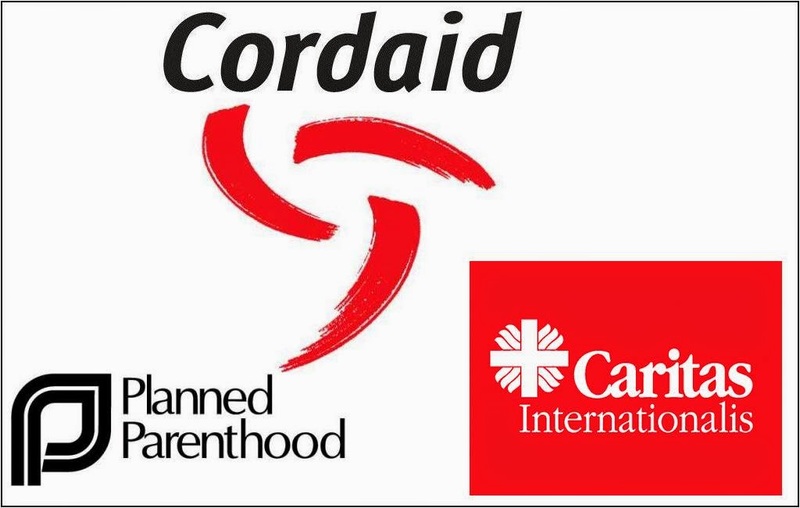 CORDAID indirectly is part of the Vatican's network of charity relief organizations, but CORDAID is passionately anti-Catholic and pro-death. 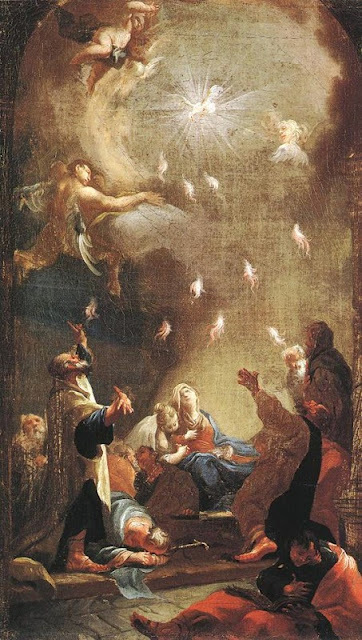 Today is the Vigil of Pentecost (Saturday after the 6th Sunday after Easter). Today's preparation should not be underestimated. Catholics should fast and partially abstain from meat today (as per 1962 rubrics) in order to better conform themselves to celebrate this High Holy Day of Pentecost. The feast of Whitsun [another name for Pentecost] is as ancient as that of Easter, and First Vespers on the Saturday following begins the liturgical season called Season after Pentecost. 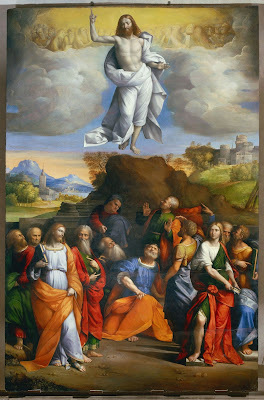 The Ascension of God's Son, Our Lord Jesus Christ, to Heaven did not leave us abandoned and helpless. 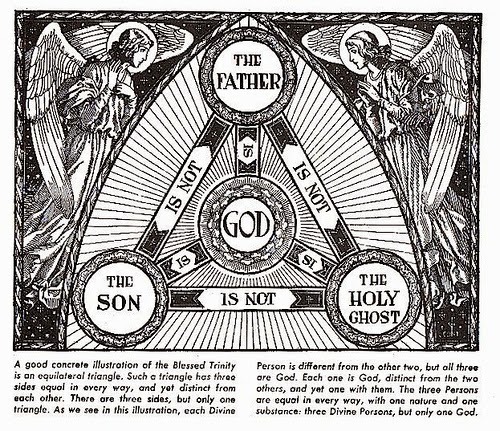 By the Divine Will, the Third Person of the Trinity is to be the soul and guiding light of Christ's Mystical Body. When I shall be sanctified in you, I will gather you together out of all the countries; and I will pour upon you clean water and you shall be cleansed from all your filthiness, and I will give you a new spirit, alleluia, alleluia! Ps. 33:2. I will bless the Lord at all times; His praise shall ever be in my mouth. V. Glory be . . .
Let the brightness of Your glory shine upon us, Almighty God, so that the Holy Spirit, light of Your light, may strengthen the hearts of those who are reborn in Your grace. Through Our Lord . . .
Now it was while Apollo was at Corinth, that Paul, having passed through the upper coasts, came to Ephesus and found certain disciples. And he said to them: "Have you received the Holy Ghost since ye believed?" But they said to him: "We have not so much as heard whether there be a Holy Ghost." And he said: "In what then were you baptized?" Who said: "In John's baptism." Then Paul said: "John baptized the people with the baptism of penance saying: That they should believe in him, who was to come after him, that is to say, in Jesus." Having heard these things, they were baptized in the name of the Lord Jesus. And when Paul had imposed his hands on them, the Holy Ghost came upon them: and they spoke with tongues and prophesied. And all the men were about twelve. And entering into the synagogue, he spoke boldly for the space of three months, disputing and exhorting concerning the kingdom of God. Alleluia! V. Ps. 106:1. Praise the Lord, for He is good, for His mercy endures forever. Praise the Lord, all you nations; praise Him in unison, all you peoples! V. For His mercy is steadfast towards us, and the truth of the Lord endures forever. At that time, Jesus said to His disciples: "If you love me, keep my commandments. And I will ask the Father: and He shall give you another Paraclete, that he may abide with you for ever: The Spirit of truth, whom the world cannot receive, because it seeth Him not, nor knoweth Him. But you shall know Him; because He shall abide with you and shall be in you. I will not leave you orphans: I will come to you. Yet a little while and the world seeth Me no more. But you see Me: because I live, and you shall live. In that day you shall know that I am in my Father: and you in Me, and I in you. He that hath My commandments and keepeth them; he it is that loveth Me. And he that loveth Me shall be loved of My Father: and I will love him and will manifest myself to him." Send forth Your Spirit, and they shall be created, and You shall renew the face of the earth. May the glory of the Lord endure forever, alleluia! Bless our offering, O Lord, and cleanse our hearts by the light of the Holy Spirit. Through Our Lord . . .
On the last day of the feast, Jesus said, "He who believes in Me, from within him there shall flow rivers of living water." He said this of the Spirit, whom they who believed in Him were to receive, alleluia, alleluia! May the coming of the Holy Spirit cleanse our hearts, and, as a heavenly dew, water them to bring forth good fruit. Through Our Lord . . . I think it is important to recall these prayers throughout all of the traditional Octave of the Ascension. 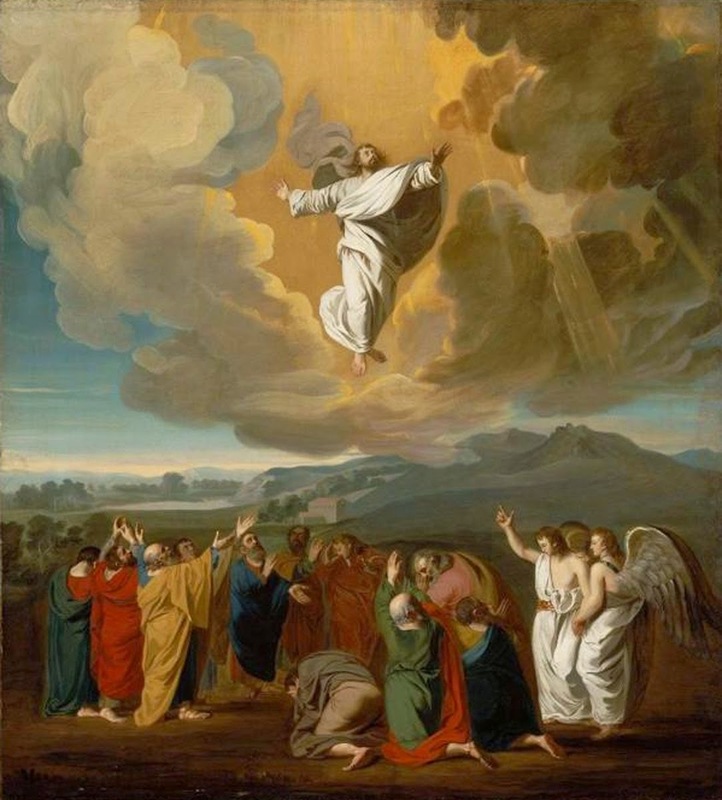 As I posted about previously, the Ascension was observed as an Octave up until 1954. These prayers would have been said on both the Ascension of the Lord as well as on the Octave Day of the Ascension. 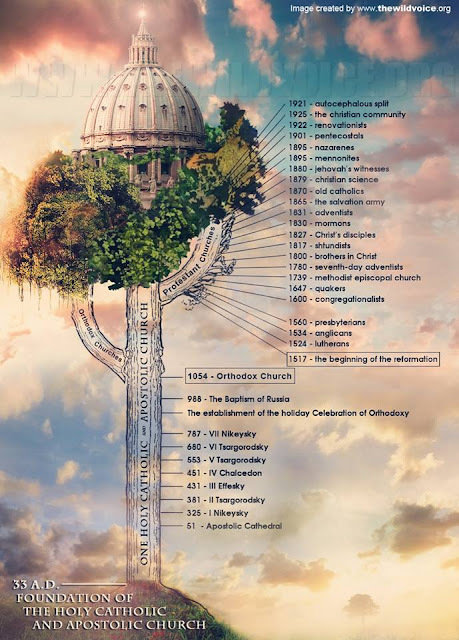 Click here for more information on Ascensiontide, including the history of the Octaves up until 1954. O Almighty God, we firmly believe that Your only-begotten Son, our Redeemer, ascended this day into heaven. May our minds dwell always on this heavenly home. Through Our Lord . . . In the former treatise I made, O Theophilus, of all things which Jesus began to do and to teach, Until the day on which, giving commandments by the Holy Ghost to the apostles whom he had chosen, he was taken up. To whom also he shewed himself alive after his passion, by many proofs, for forty days appearing to them, and speaking of the kingdom of God. And eating together with them, he commanded them, that they should not depart from Jerusalem, but should wait for the promise of the Father, "which you have heard"(saith he) "by my mouth. For John indeed baptized with water: but you shall be baptized with the Holy Ghost, not many days hence." They therefore who were come together, asked him, saying: "Lord, wilt thou at this time restore again the kingdom of Israel?" But he said to them: "It is not for you to know the time or moments, which the Father hath put in his own power: But you shall receive the power of the Holy Ghost coming upon you, and you shall be witnesses unto me in Jerusalem, and in all Judea, and Samaria, and even to the uttermost part of the earth." And when he had said these things, while they looked on, he was raised up: and a cloud received him out of their sight. And while they were beholding him going up to heaven, behold two men stood by them in white garments. Who also said: "Ye men of Galilee, why stand you looking up to heaven? This Jesus who is taken up from you into heaven, shall so come as you have seen him going into heaven." God ascends His throne amid shouts of joy, the Lord is taken up with the sound of trumpets. Alleluia! V. Ps. 67:18-19. The Lord is in Sinai, in the holy place; ascending on high, He has led captivity captive. Alleluia! At that time, Jesus appeared to the eleven as they were at table: and he upbraided them with their incredulity and hardness of heart, because they did not believe them who had seen him after he was risen again. And he said to them: "Go ye into the whole world and preach the gospel to every creature. He that believeth and is baptized shall be saved: but he that believeth not shall he condemned. And these signs shall follow them that believe: In my name they shall cast out devils. They shall speak with new tongues. They shall take up serpents: and if they shall drink any deadly thing, it shall not hurt them. They shall lay their hand upon the sick: and they shall recover." And the Lord Jesus, after he had spoken to them, was taken up into heaven and sitteth on the right hand of God. But they going forth preached every where: the Lord working withal, and confirming the word with signs that followed. After the Gospel is read, the Pascal Candle is extinguished. God ascends His throne amid shouts of joy, the Lord is taken up with the sound of trumpets, alleluia! Accept, O Lord, the gifts we offer to celebrate the glorious ascension of Your Son. May Your mercy free us from our present dangers and lead us to eternal life. Through Our Lord . 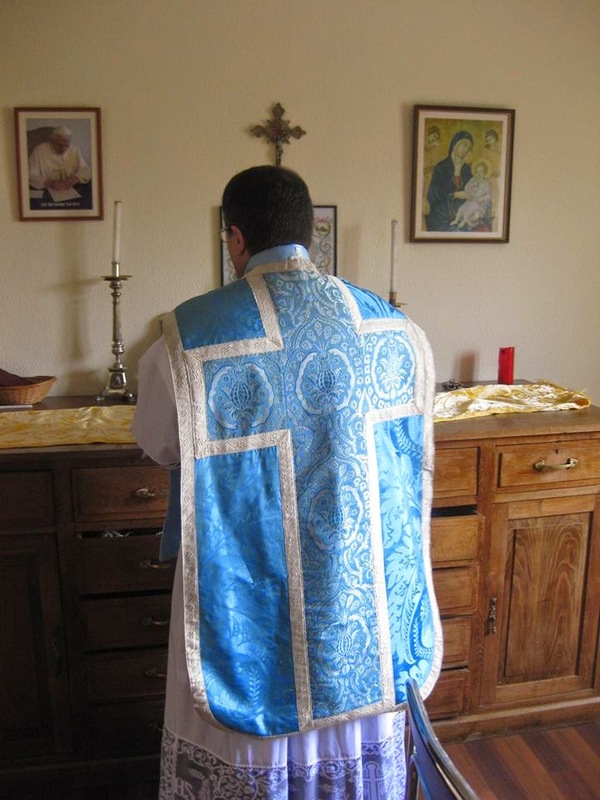 . .
Almighty and merciful God, grant that this Sacrament, which we have received in this visible sacred Rite, may bring us Your invisible help. Through Our Lord . . .
"From the Other Side: A Look into the Catholic Church," Betty Jean Jeffries, 129 pp., 1954, Bruce publ. "Christian Maturity," John Donohue, SJ, 214 pp., 1955, Kenedy publ. On this anniversary of the apparitions of Our Lady at Fatima, Fr Dominic reminds us that the Fatima Message is Heaven's Plan to bring the world back to God. 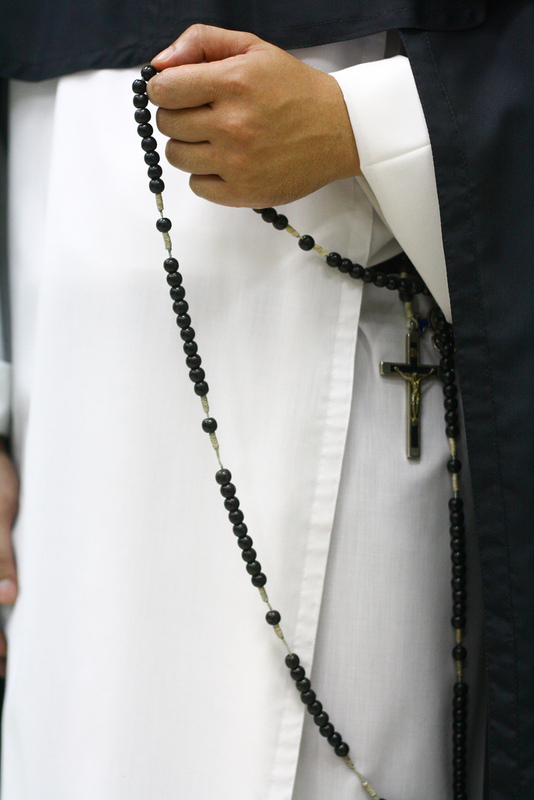 Let us hear and observe Our Lady's message to stay away, hate, and fight sin; mortify ourselves and do penance, and lead lives of prayer and devotion, especially praying the Holy Rosary at least once a day. This is especially important concerning the recent death of Fr. Gruner, the Apostle of Fatima. If you never read his book "Crucial Truths to Save Your Soul" then you must. It is a short, inexpensive book that I am highly recommending. 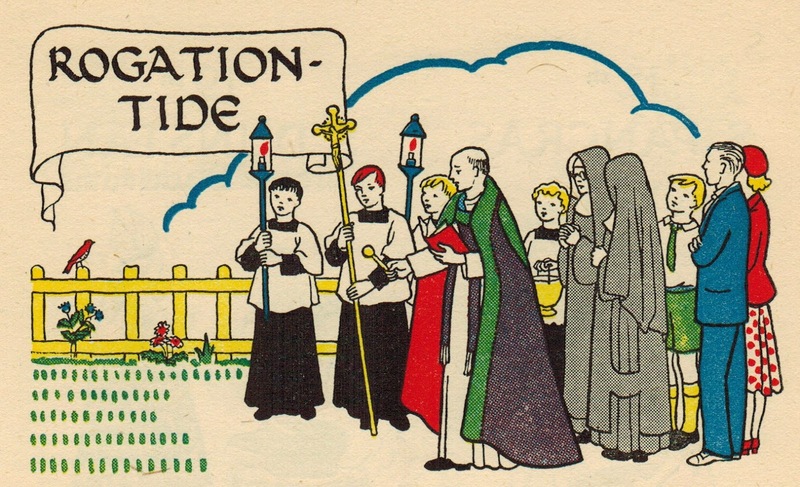 Last month we observed on April 25th the annual Major Rogation Day. I have previously posted on the Rogation Days & Ember Days as they occur throughout the year. 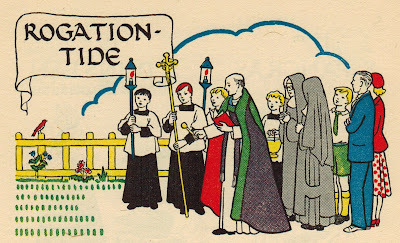 We are now beginning the Minor (Lesser) Rogation Days that lead up to Ascension Thursday. Like the Major Rogation, these are days to perform penance, fast, pray litanies, and petition our Almighty God to spare us from natural disaster, to bless our crops, and to save us from our sins. These were previously days of fasting before changes to the Roman Liturgy that took place even before Vatican II. I also previously mentioned a wonderful booklet produced by Fr Christopher Smith, a priest of the Diocese of Charleston. 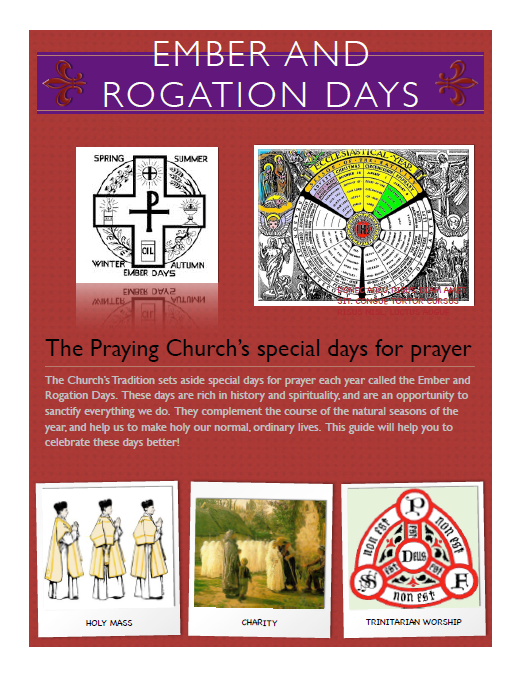 This guide on the Ember & Rogation Day is a great ready for today. It can be downloaded from dropbox. Today is the Feast of the Apparition of St. Michael the Archangel. 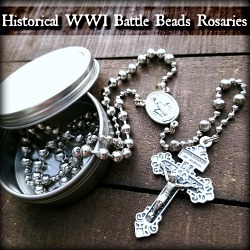 Traditionally in the Liturgy of the Church, there were two feasts in honor of St. Michael. Those familiar with the Litany of Saints will also recall that his name is mentioned by name in the Litany. And those who attend the Traditional Latin Mass will be familiar with several references to St. Michael in the course of the Liturgy. St. Michael is regarded as the special Guardian Angel of Saint Joseph and the Guardian Angel of each one of the Popes and one of the seven great angels who stand before the throne of God. In the 6th century, the angelic St. Michael appeared in southern Italy on a mountain named Gargano. 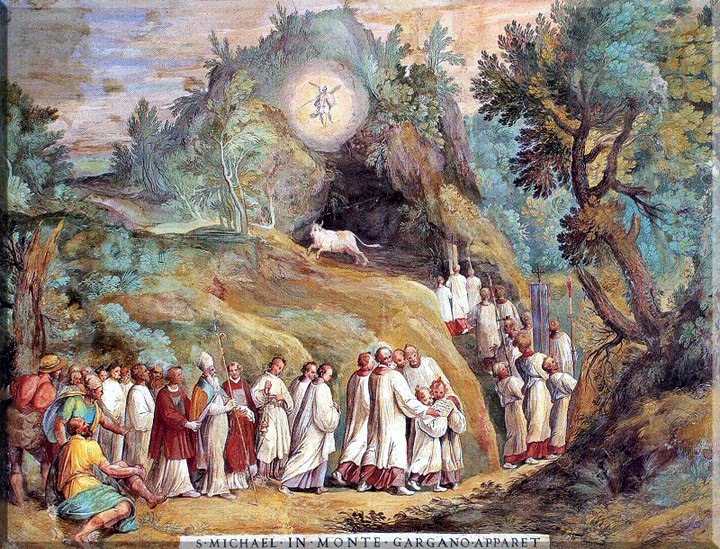 In this apparition St. Michael asked that the cave in which he appeared would become a shrine to the True God in order to make amends for the pagan worship that once occurred there. The Sanctuary of Monte Sant'Angelo sul Gargano still remains to this day. St. Michael later appeared with a flaming sword atop the mountain during a storm on the eve of battle for the Lombards. The Lombards attributed their victory in battle on that day, May 8, 663, to St. Michael. And the Church then established a Feast in honor of the Apparition of St. Michael on May 8th. That Feast is still kept in the Roman Catholic Calendar of 1962 used in the Tridentine Latin Mass. On September 29th the Feast of the Dedication of St. Michael occurs on which we, for the second time in the year, honor the Glorious St. Michael. On Mount Gargano, the commemoration of the blessed archangel Michael. This festival is kept in memory of the day when, under his invocation, there was consecrated a church, unpretending in its exterior, but endowed with celestial virtue. The first apparitions of the archangel Michael in Western Europe were granted to the Bishop of Sipontum in Apulia. Three times the Archangel appeared, nightly, the last time on September 29, 493. The Archangel indicated the transformation into a Christian church of a grotto sacred to Mithras, on Monte Tumba. 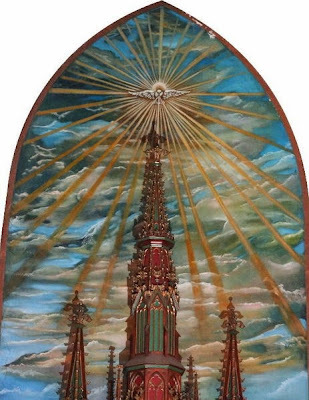 Miraculously, when the bishop and companions arrived, they found that a primitive altar had already been erected, covered with a vermilion altar cloth and surmounted by a Cross; moreover, according to the legend, they found the footprint of Saint Michael in the rock. With immense joy the holy bishop offered the first divine Sacrifice. It was 29 September. The Feast of the Dedication of St. Michael the Archangel is the September 29th Feast often just called: The Feast of St. Michael the Archangel. Theirs have always been hours of study, industry, prayer, service - and song. Monastic chant echoed off the walls of the Monastero di San Benedetto di Norcia for more than 800 years before Napoleonic laws suppressed this branch of the Benedictine order in 1810, causing a break in the continuity of music in Norcia for nearly 200 years. 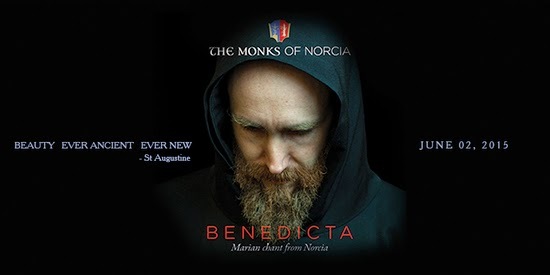 But when a Benedictine Community founded in 1998 by Father Cassian Folsom sought a monastery, the town of Norcia welcomed the monks back to the birthplace of St. Benedict, and the music began again. This is the story of The Monks of Norcia. Their alluring chant has been masterfully captured by 11x Grammy Award winning producer Christopher Alder. De Montfort Music has teamed with Universal Music Classics and Decca Records to bring this transcendent debut to you directly from within the monastery walls of Norcia. Benedicta consists of songs dedicated to the life of Mary, Our Lady, including previously unrecorded chant versions of responsories and an original piece composed by the monks, "Nos Qui Christi Iugum". Benedicta will be available on June 2nd, 2015. Order now on Amazon.com by clicking here.